Characteristic dark color, deep A horizon, and artifacts of an Amazonian dark earth near Manaus, Brazil. 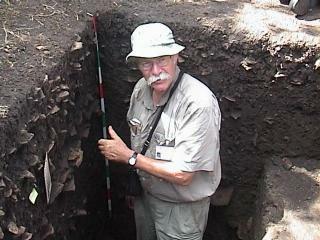 Wim Sombroek (ISRIC, The Netherlands) explains the profile characteristics during a recent meeting in Manaus, Brazil. 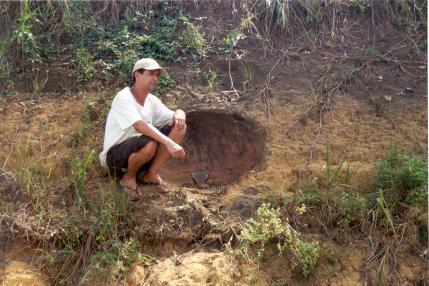 Burial urne below the enriched horizon at a road cut near Manaus, Brazil. Eduardo Neves (University of Sao Paulo) demonstrates the significance of the findings. 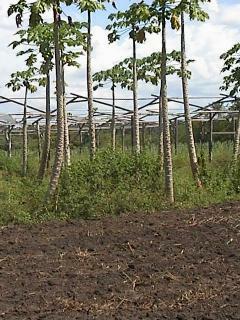 Papaya is a typical crop that produces much better on the dark earths than adjacent upland soils.